Again, quite a lot has happened since my last wedding dress update. Researching and buying my new sewing machine took a considerable amount of time but I’ve still managed to do quite a bit of work on the dress. Made the waistband and attached it to the dress with a few stitches here and there. Detailed view of the inside of the neckline. Notice the two seams needed to keep it in check. To finish the neckline, I basically had to hand sew it twice. The first seam was needed to force the silk chiffon to simply stay in place. Since I wanted the “zig-zag” pattern to be prominent, I had to stretch the fabric around the edge before securing it. The tension then caused the neckline to tilt out from the body. 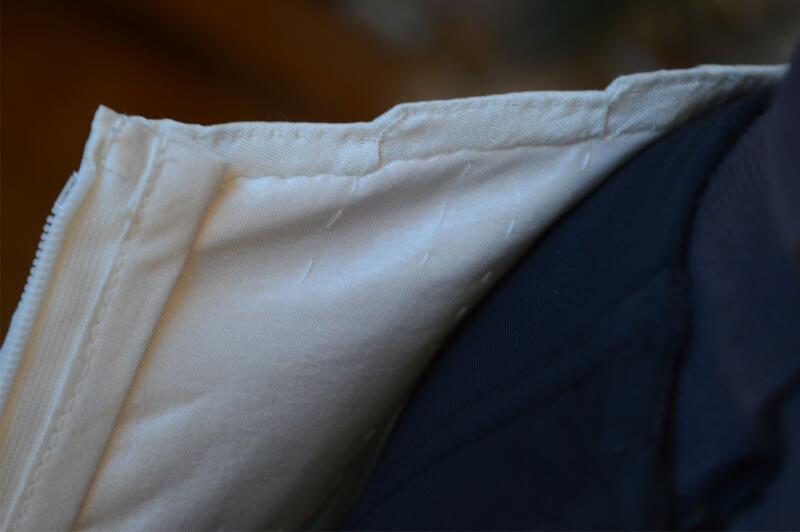 The tilting was fixed by stretching the fabric even further and then securing it with the second seam. Attaching the last to layers and sewing them to the zipper wasn’t very hard, only time-consuming :) One interesting detail worth mentioning was the french seam below the zipper. It was a bit tricky and required a bit of hand sewing closest to the zipper but the result was pretty nice. Think I’m gonna post a guide on that when I can prepare some clear how-to pictures. Last but not least, the back of the dress! 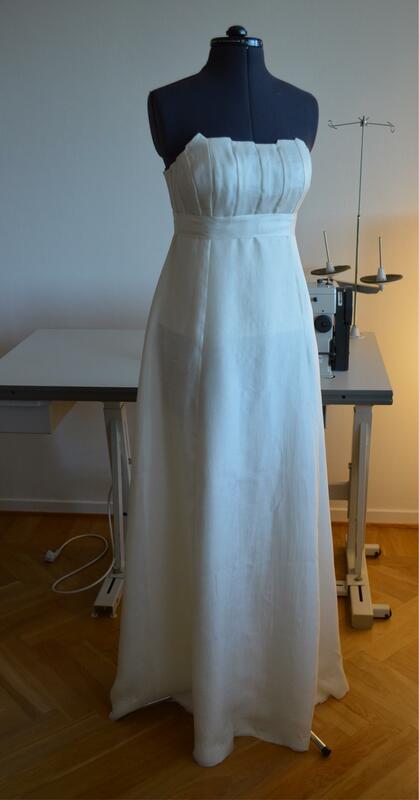 Categories: Uncategorized, Work-in-progress | Tags: clothing, sewing, wedding dress | Permalink. Ty :) Perhaps I’ll log on some time during the weekend :) Btw, you don’t feel like playing Dota 2 with me? Oh, Nicole, den ser jätte snygg ut, vad duktig du är, jag tror den ser ännu finare på dig när den är klar. Wihoo, looking good girl, can’t wait to see you in it! Thanks :) Yay! That’s great :D I’m so excited about making a knot pillow for myself. 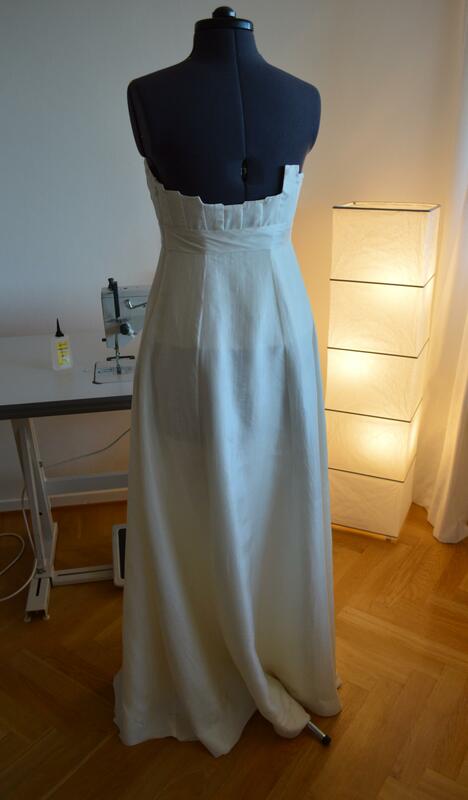 But I know that I need to finish the dress first :( But one skirt is done, only two more to go! Thanks, I’m using the “Yoko” theme.